Written on January 28, 2010 by Kevin. Psst. The winter Olympics will be starting soon and Pampers is taking advantage of it by offering free samples. They are offering a sample three-pack of Pamper Cruisers with Dry Max on their website Pampers.com. These are the same diapers that are going to the Olympics on the small children of the USA athletes. They help lock wetness away for up to 12 hours which is said to be their driest diaper ever. These diapers go officially on the shelves in March so take advantage of these freebies by checking out Pampers.com. Definitely sounds like a gold winning freebie to me. Written on January 25, 2010 by Kevin. 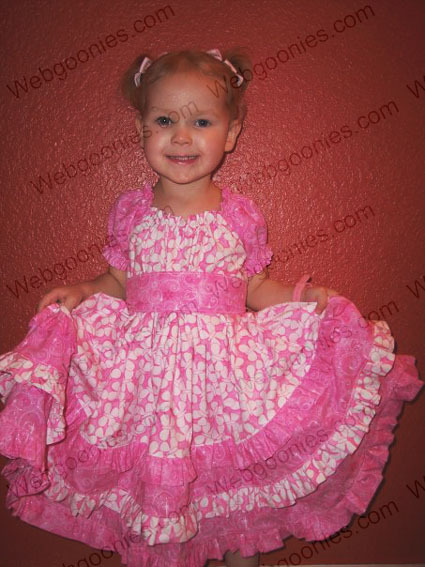 Here is a picture of Kaitlyn showing off a dress that her mom recently finished sewing. She is a great model. Written on January 18, 2010 by Kevin. We headed out on Saturday with our neighbor friends to a local urgan lake that was recently restocked. We woke up super early hoping to catch the early morning trouts but had no luck. We couldn't even get a nibble. The kids were definitely bummed and quickly were turned off from fishing. We will try again in a few weeks. They are bound to get some excitement one of these tries. Written on January 15, 2010 by Rylan & Kaitlyn. Well of course the special thing we did last weekend was head over to Disneyland. We went for 2 days and we had a blast. The crowds were very light and the weather was perfect. We had a chance to see a whole bunch of characters and just take our time. We went on the It's a Small World a bunch of times and we loved singing the songs. They had it Christmas themed so that made it even better. Kaitlyn is our princess but she really turned into one when Mom got her a princess dress at the park. She looked beautiful and received many compliments. As for me, I slayed the dragon and earned a shield and sword. We really had a great time. We have been relaxing this week after coming home and not doing much. We haven't even removed our Christmas decorations yet. That's OK though because Christmas is definitely our favorite holiday. Maybe we will just leave it all up until next year. I guess that's about it. I think we have something planned for tomorrow early morning so that should be pretty exciting. We will definitely be getting pictures of it as well. Until then, have a good weekend. Written on January 14, 2010 by Kevin. Written on January 13, 2010 by Kevin. Written on January 8, 2010 by Rylan & Kaitlyn. We had quite a bit going on this week. We headed out for New Years Eve with our neighbor friends. We all had a nice dinner. Everyone was jealous that Kaitlyn and I had super pancakes on our plate. Mom put whipped cream, candies and even a cherry on top. It was a great way to celebrate the holiday. We even had a chance to try some sparkling cider too. Our Moms Grandma came to town from El Paso and we hung out with her quite a bit. Of course most of it revolved around eating but that was OK. Our dad made us some BBQ Tofu blocks for one of the meals but it wasn't very good. Better luck next time dad. The best part about people coming into town is when we get a chance to sing and dance for them. Our favorite thing right now is singing the "You put the lime in the coconut" song. Kaitlyn loves to yell "Call the Doctor!". It's really funny. 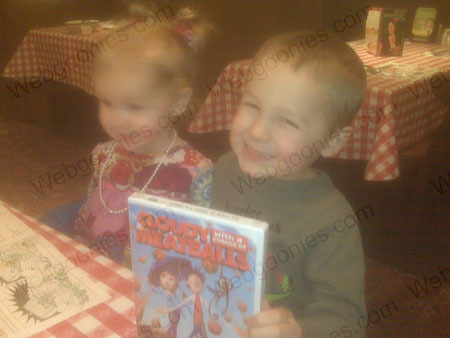 As our Dad mentioned the other day, We won the 'Cloudy with a Chance of Meatballs' DVD. We won when our Mom and Dad ordered a special pizza at Buca Di Beppo that they were offering. We went back the next day with our Grandma Michele to pickup the DVD and have another meal. It's always fun eating meals with the Grandparents. We have a special weekend planned and we will definitely be putting pictures up soon. It's going to be fun. I hope you all can have a good of a weekend as we will be having. Cloudy with a Chance of Winning.. Written on January 6, 2010 by Kevin. The other night we headed out for dinner and decided on Buca Di Beppo. A good family style Italian restaurant that we know is rarely busy and is perfect for possibly rowdy kids. As we sat down I grabbed a flyer informing of their new meatball pizza for a promotion they are doing with the movie 'Cloudy with a Chance of Meatballs'. They were offering a chance to win a copy of the movie if you purchased the new pizza. We thought about it for a moment and decided that since this place is always so slow and kids seem to be scarce, it may be a good idea to try for the freebie as the chances of winning are likely. Turns out we made the right choice. The manager came up moment after ordering the pizza to inform us that rather than a random pull from a hat, they had a few copies to give away to the first amount of people and we fell into that. We were thrilled. We picked up the DVD last night and the kids were excited as expected.